with more adventures for readers of all ages to enjoy this summer. Chi is a michievous newborn kitten who on a leisurely stroll with her family finds herself lost and alone. Seperated from the warmth and protection of her mother, desperately attempts to reunite with her family of feral cats. When the kitten feels all hope is lost, she is found in a park by a young boy named Yohei and his mother. After taking a tumble Yohei feels just as distraught as the kitten he sees before him, and he quickly takes comfort in feeling a sense of sympathy with the cat. And before she could even know what hit her, the little kitty was picked up and soon under the protection and care of Yohei's family--the Yamadas. Every moment of their daily life is filled with something we can all cherish. 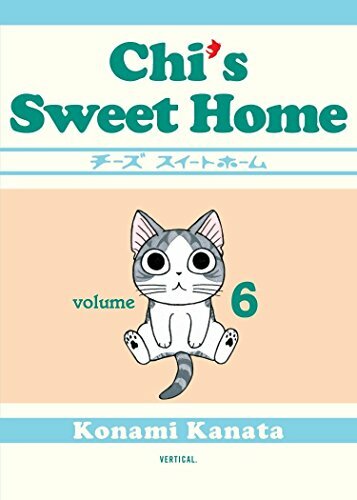 In the latest volume of Chi's Sweet Home, the titular kitten takes to the streets with unbridled curiosity. Exploring her new surroundings she encounters countless new friends, including another young feline named Cocchi. This new kitty comrade opens up a whole new world for our star. Prior to this encounter she had a mild awareness of what it was like to be a cat. To Chi, she was Chi and the Yamada's were her clan. But now with another one of her kind clearly there, she is more willing than ever to accept that a cat's world is one that she should be and will eventually be a part of. So while on a rare night excursion, our furry heroine reunites with an old friend and is introduced to a world where a whole community of cats of all shapes and sizes congregate in the twilight. This reunion with her mentor Blackie allows Chi to slowly move closer and closer to that long awaited reunion with her own cat family. Even if she is no longer searching for her own original home it is suddenly closer than it's ever been. If you have any questions about this product by Vertical, contact us by completing and submitting the form below. If you are looking for a specif part number, please include it with your message.